In the 90’s I worked in nutrition communications in the dairy industry (my first job!) and those were dark days when far too many health professional treated butter like a poison. We totally lost sight of the fact that a little fat goes a long way to add flavour and well, if your veggies taste better, you’ll eat more of them (surprise!) and that offers huge health benefits as well. So I say yes enjoy some herb butter with your spaghetti squash guilt free (see recipe below). A spaghetti squash makes about 4-5 cups but no worries about it going to waste, you’ll easily use that up by trying some of the ideas here in Spaghetti Squash 4 Ways . Dietitian's Tip:Spaghetti squash may be hearty and filling but serves up only 22 calories per half cup. Kids Cook: If you have a herb garden, let your child choose what herbs to use in your herb butter. Make herb butter. In bowl, mix together 2 tbsp softened butter with 1 tsp EACH dried basil and dried thyme or 1 tbsp fresh herbs. 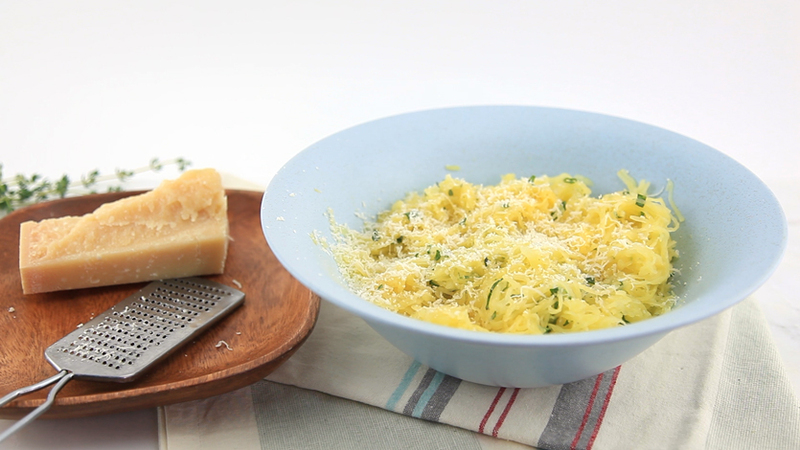 In a large bowl, toss 4 cups hot shredded cooked spaghetti squash with herb butter. Sprinkle with 1/3 cup grated Parmesan cheese, salt and pepper to taste. • Add to recipe above cooked shrimp, a squeeze of lemon and a few chopped parsley leaves. Grilled meats or fish would work as well. • Spaghetti squash is an easy veggie to work with to build flavour. Try this. Stir 1 tsp garam marsala and 2 tbsp butter into 2 cups of cooked spaghetti squash and top with crumbled paneer. How can I help my child to eat healthier lunches?